Hit the throttle and accelerate through the fantastic world of Stardrone. Mix of arcade action, pinball, breakout physics and collect-the-objects with just one-button control. 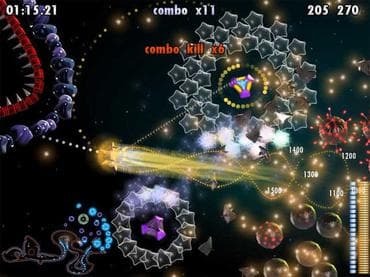 Star Drone is a high-speed action thriller with a mix of arcade action, pinball, breakout, physics and collect-the-objects. In Star Drone , you pilot the always-in-motion spaceship through diverse cosmic environments in order to beat each of the game's 60 levels' goals. Goals can range from getting to the end of the level, to destroying all enemies, to collecting certain items. Each level starts by aiming and shooting yourself into the outer space from cannon. Your spaceship is always in motion from this point on, and it's your job to attach to nearby gravity beacons to navigate your flight path. While tethered to a beacon, you can swing and attempt to circle the beacon until you release and slingshot yourself further. This core mechanic allowed us to bring together elements of shoot 'em up, pinball, collecting objects and exploration in one game that has no counterpart anywhere in the world. If you have questions about Star Drone game, please contact us using this form.